I arranged a shoot with model Inka Blink in Oxford. We met up and walked around parts of the city making photos with both natural light and with a Speedlite fitted with the Lastolite Ezybox Speed-Lite 2. I had brought along an EOS 200D camera for InkaBlink to use as a prop. For part of the shoot, I wanted some photos of the camera in use. I always need these kinds of photos for inclusion in articles that I write. 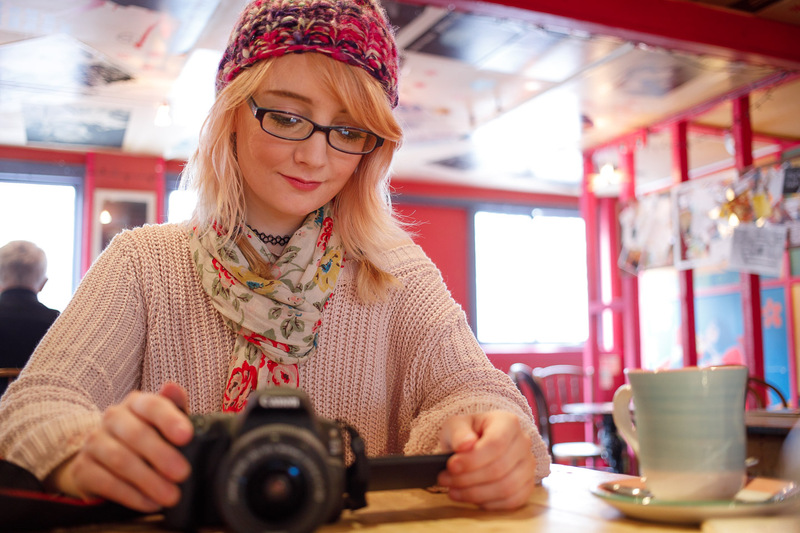 Part way through the shoot we stopped at a cafe in Oxford’s covered market for a cup of tea. Whilst sitting at the table I explained how the EOS 200D could be remote controlled from the camera connect app on my iPhone. Then, I used the app to remote control my EOS 5D Mark IV too. I put the EOS 5D Mark IV on the table with the EF 40mm f/2.8 STM pancake lens, and continued our conversation while watching the phone screen. I took this picture by tapping on the phone screen to position the AF point. It’s all natural light, a good amount was bounced back from a mirror that was facing Inka Blink.